NeverSeconds: Hello again from Dae Han Min Guk! Hello again from Dae Han Min Guk! (대한민국) is the name of Korea in Korean! Today here it is very rainy. They say we have a typhoon coming again! We hope that Veg and family is okay after the lightning strike. And that everyone in US is okay after hurricane there. company and get home very late, so women cook dinner. It isn’t that hard always because rice is made in rice cooker and kimchi is made only a few times a year with the whole family or you can buy. We aren’t sure why we use metal chopsticks here, it is just normal for us! 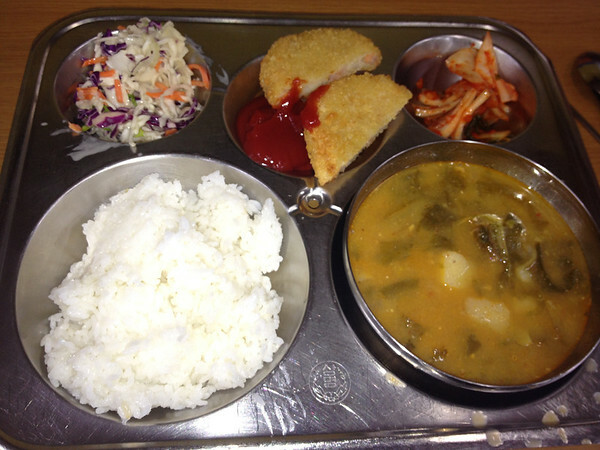 Today’s lunch was white rice (밥 bap), salad, fried shrimp patties with ketchup, kimchi, and gamjatang (감자탕). Gamjatang is a soup with pork bones and potatoes. The meat is on the bones (from the neck) and you need to scrape it off. It is little bit spicy. If you have any other question please ask today because tomorrow is sadly our last day to post ㅠㅠ (This is the cry sign in Korean). Thanks 한식, we're getting back to normal after lightening thank you. If you'd like to say hi to Veg and I at the SXSW festival next year in the USA you'll need to vote for our talk here so we get to go! Look forward to meeting as many of you as possible! I have really enjoyed your week of seeing and hearing about your very yummy looking food! Congrats on your week at blogging on here, and I hope you all stay safe from the typhoon. South Korea is most certainly a place I would love to visit. thanks again for the lovely insight to your food. The fried shrimp patties look a bit like our chicken nuggets here in America. Or at least the chicken nuggets we were served back when I was in Elementary School. Goodness, that was a long time ago haha. I would eat this lunch though, looks very tasty. My father introduced us to many Korean foods when he was stationed there for the Army. He really likes Kimchi and I really like bulgogi. Yum! Thanks for sharing! Hello, when you say that the soup is little spicy it made me curious as to what spices are popular in Korea. I am used to Chinese and Indian spices but I find all countries have their own favourte spice blends and was wondering which ones you use most. Do you eat with a knife and fork or with chopsticks? This week has been so interesting, I have a better understanding of Korean food and plan to do some tasting soon. One thing I have not seen are desserts, there have been no sweets and only a cup of grapes as fruit. Is this typical of the Korean diet? additionally, I have not seen any dairy on the menu. A thank you to your teacher for giving so much background information. I have often wondered why old civilisations in the east never got around to inventing the knife, fork and spoon eating style that we have in Europe.... and why they do not adopt that way of eating now. do all people stick to the traditional chopsticks ? If you're interested to know, forks have been discovered in ancient Chinese burial sites dating as far back as 2400-1900 BC. However, because knives were considered weapons and forks were considered gardening tools (like a rake or garden fork), over time, dining etiquette banned them from the table. Bringing weapons to the table was considered barbaric and bad manners. Today, chopsticks are pretty much second nature to those who use them regularly! At what age would a child start eating soup with bones? Here in America, I would sit and pull the meat off for my 5 year old, and for my husband too. This has been an interesting week. I really don't even think I've ever had Korean food but you guys have made me want it! Seria bueno que alguna vez pruebes la comida del Perú es muy buena. Saludos.